My kids spend probably ninety percent of the day in our backyard playing and creating. Water activities are always a favorite! 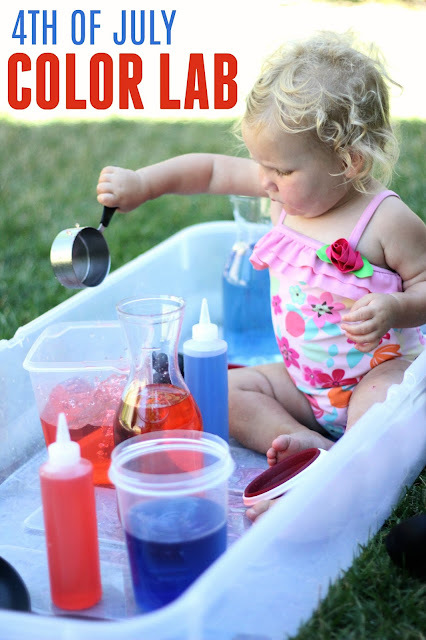 For Day 4 of our A Very Toddler Fourth series we set up a 4th of July Color Lab in the backyard inspired by No Time for Flashcard's Color Lab Science and Busy Toddler's Pouring Station. The kids splashed, poured, squeezed, dripped, and mixed. If you're just joining in, you can find all of our A Very Toddler Fourth activities HERE. We've teamed up with Jenae at I Can Teach My Child to share a whole week of 4th of July fun with you! 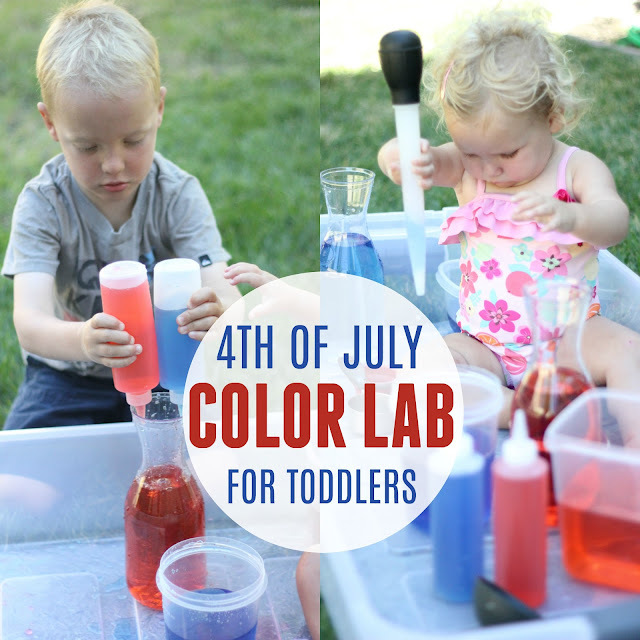 Our 4th of July Color Lab only required a few materials to make a HUGE amount of fun! This post containers Amazon Affiliate links. Before we got started I set up our color lab and had one of my big kids distract my toddler so that she didn't invade before I was ready. She spied the water and colors immediately and was chomping at the bit to get started! I added a few drops of food coloring into each container (either red or blue to keep with the 4th of July theme) and then I mixed them up and let my toddler start playing! Of course my other kids couldn't keep themselves out of the fun either... it just looked too inviting! My preschooler and I talked about color mixing and he had fun making a variety of different hues of purple as he mixed the reds and blues together. Our color labs always turn into drinking stations for my toddler as well. She has to try every liquid she gets her hands on! She would rather drink than eat! After we were done exploring the colors and water, this activity was quick and easy to clean up and hose down! I have a feeling we'll be doing this often this summer! It was such an inviting way to spend the afternoon! Do your kids like playing with water?